Is Ford Hiding GT500 Horsepower And Torque Figures In Plain Sight? Ford used Easter eggs to give away 2018 Mustang GT's power figures in the sales brochure. Why would this time any different? Now that Ford that the next GT500 will make a splash at some point in 2019, expect rumor mills to go into overdrive as they attempt to make sense of the few hints that have been released so far in order to paint a more vivid picture. For now, the Blue Oval has at least acknowledged the car’s existence but it has yet to release any concrete details about the GT500 aside from telling us it will have a supercharged engine making more than 700 horsepower. That news was obvious, though, mainly because no self-respecting Ford fanatic wants to let a Hellcat owner win bragging rights by using a more muscular engine. Thankfully, they probably won’t have to endure that shame. 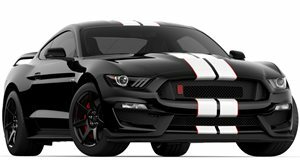 If the latest hypotheses from the recesses of (via ) hold water, the 2019 Mustang GT500 will come with 772 ponies. But how did a bunch of Internet sleuths arrive at that number? The same way they (mostly) guessed the 2018 GT’s output: by looking for Easter eggs, whether perceived or real, in the sales brochure. Last time they were found in pictures of Ford’s new 12-inch LCD gauge cluster, which is split into two zones. The tachometer sits on the left side of the screen and shows the current gear in the center of the ring. Meanwhile the speedometer is placed on the right and encircles a digital readout of the current vehicle speed. Last time Ford previewed the readout, it showed the Mustang GT in 4th gear going 55 mph, which translates to "455" horsepower when trying to glean a horsepower figure from those numbers. That brochure came out only six months before the GT's power figures were released, and the 5 horsepower difference is a margin of error we're happy to accept. In the , we can see the Mustang in 7th gear going 72 mph. Put the two together and you get a solid 772 horsepower. Sure, it’s a bit of a reach to assume that this is Ford trying to tell us the exact power output it intends for the GT500, but it's worth considering. But wait, there’s more. As long as hungry fans will bend what they see to fit their wildest dreams, there will always be more. Another number that looks like it could hold significance comes from the odometer, which reads “74.3 miles.” Twisted another way, that could be interpreted as 743 lb-ft of torque, a reasonable output provided that the 772 horsepower figure is also true. There’s no telling when Ford will show all the cards it’s holding, but if it really did pepper its brochure with Easter eggs, then at least we know it has a lousy poker face to go with the killer hand.